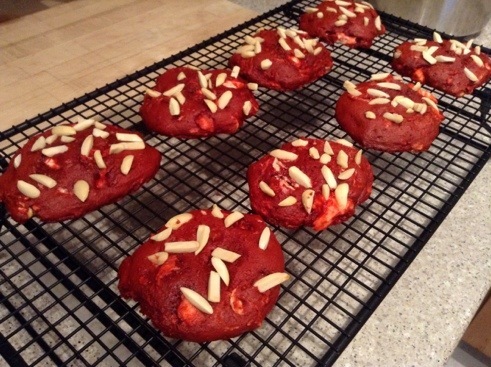 White Chocolate and Almond Red Velvet Cookies pretty much says it all, folks! I am giddy beyond belief just making and sharing this soft and decadent cookie recipe! Red velvet anything makes me irrepressibly happy and is just is one of the few chocolate deserts I really go nuts over. Don’t get me wrong Chocoholics, it’s not that I don’t like chocolate or cocoa. Nay nay! Given the choice, however, I’m simply more likely to go after a red velvet cupcake with cream cheese frosting than the walnut brownie or fudge square (so maybe its a texture or consistency thing). 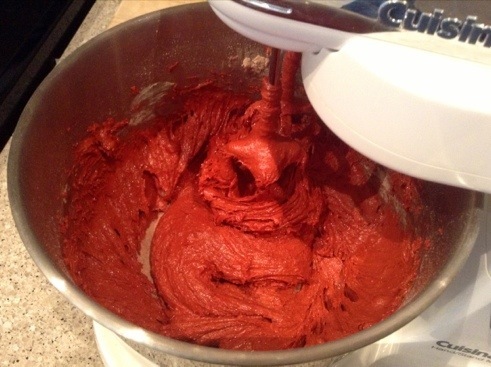 “Red velvet cake is a cake with either a dark red, bright red or red-brown color. It’s traditionally prepared as a layer cake topped with cream cheese or cooked roux icing. 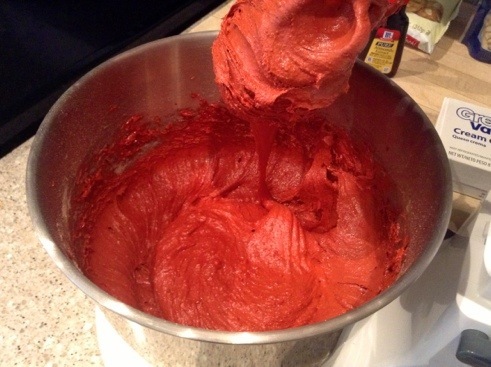 The reddish color is achieved by adding beetroot or red food coloring. 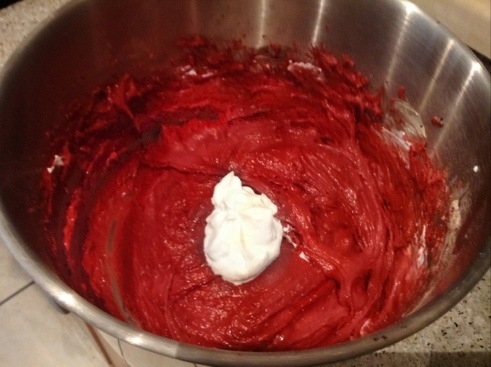 So there you have it, a brief explanation of Red Velvet Cake. While reading the Post-Gazette article, I was especially interested to learn that before 1850 and the production of baking powder, there were no standardized tools or system for measuring ingredients for breads or cakes. A “cup” might have been a tea cup or anything on hand. What a nightmare! And while some still still employ the “dash of this, pinch of that” methodology (I know I do), you have to admit that without measurements, sharing consistant recipes would be virtually impossible. So remember, the next time you’re measuring something, to appreciate the necessity from which all technology is derived. This recipe is adapted from Momstestkitchen.com. Thank you for sharing those beautiful photos, from which this recipe was definitely inspired. A delicious cornucopia of baking ingredients! 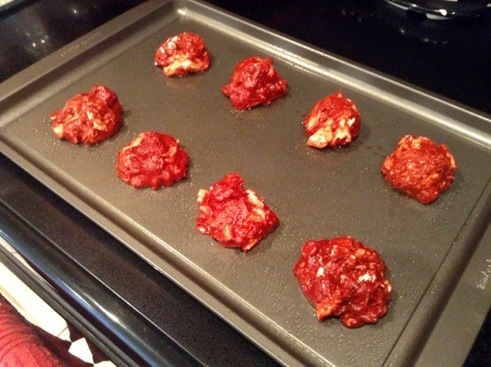 Use a non-stick cookie sheet or spray baking sheet spray with non-stick baking spray. 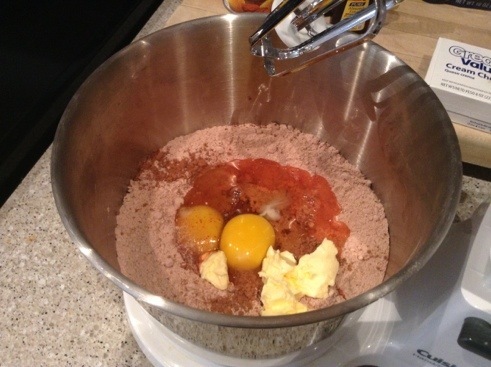 In a large bowl, combine the cake mix, eggs, butter, almond paste, vanilla and almond extract, and buttermilk. 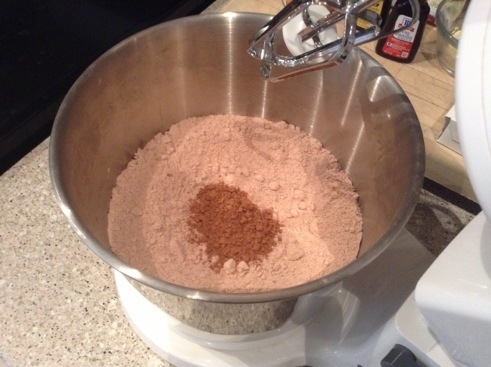 Add more cocoa for a richer flavor or add 1/4 cup of sour cream for a smoother less intense chocolate. 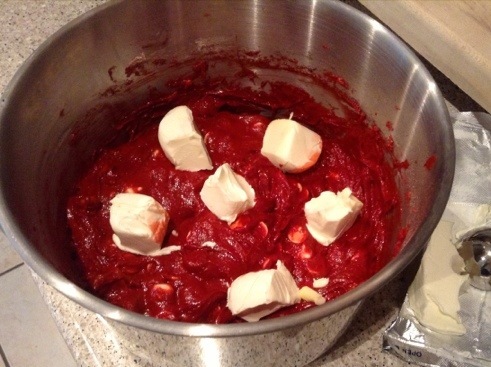 Then, using a tablespoon, drop softened cream cheese into the batter. and gently swirl in using a butter knife or similar utensil. 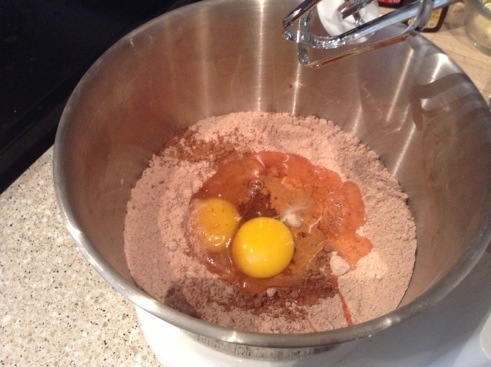 Remember: you want the swirls, not the complete mix of ingredients so be careful not to over mix. Drop the batter by tablespoons onto the baking sheet about 2 inches apart. 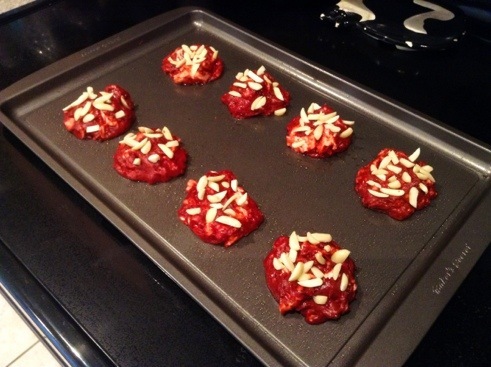 Sprinkle on sliced or slivered almonds and bake for 10-15 minutes or until the cookies are set. Remove from oven and allow to cool for a couple of minutes on the baking sheet then remove to a wire rack to cool completely. Makes 2 dozen cookies. 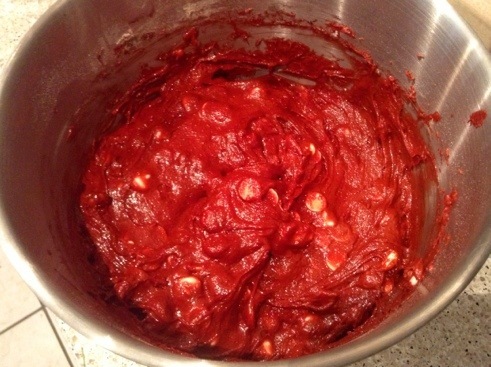 Pour the red velvet cake mix into a mixing bowl. 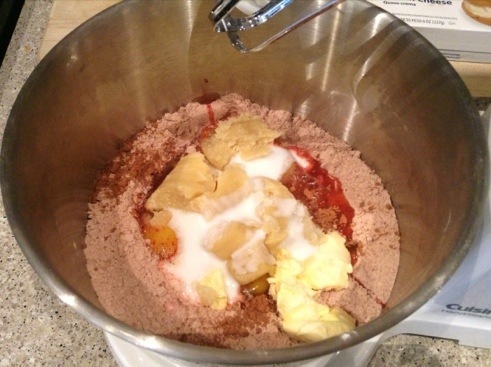 Using an electric mixer is recommended. 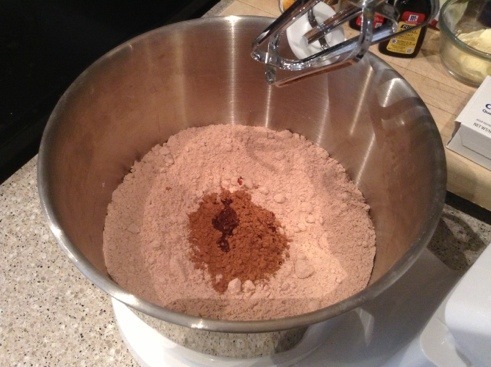 For a richer flavor, if desired, add two tablespoons of unsweetened cocoa. Oh, yeah. I desired. Add a teaspoon of almond and vanilla extract each. …and for kicks, a cup of almond paste. Pour in two tablespoons of buttermilk. 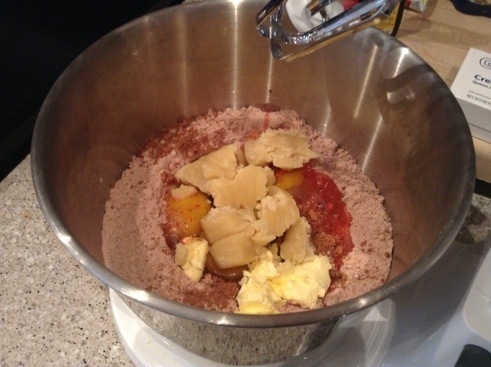 And blend until the cookie dough takes on a thick and gooey consistency. 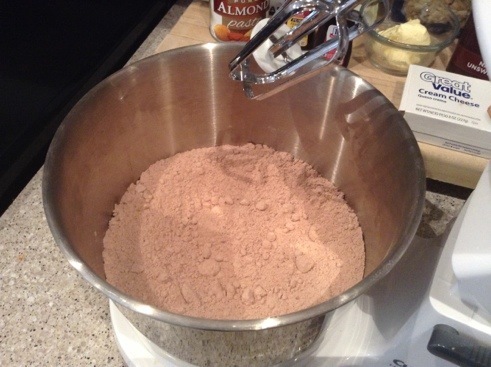 Use a rubber spatula to push along the sides and beaters if batter clumps. …because, as you can see, none of that fantastic color is lost. 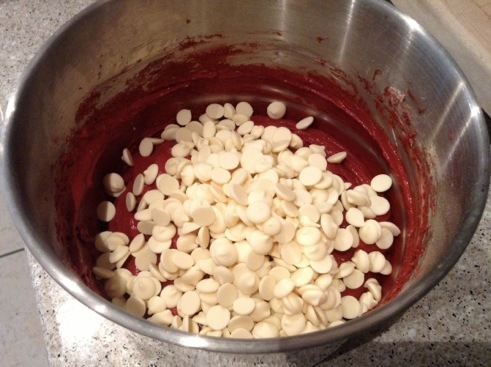 Pour in white chocolate chips, two cups is about perfect. 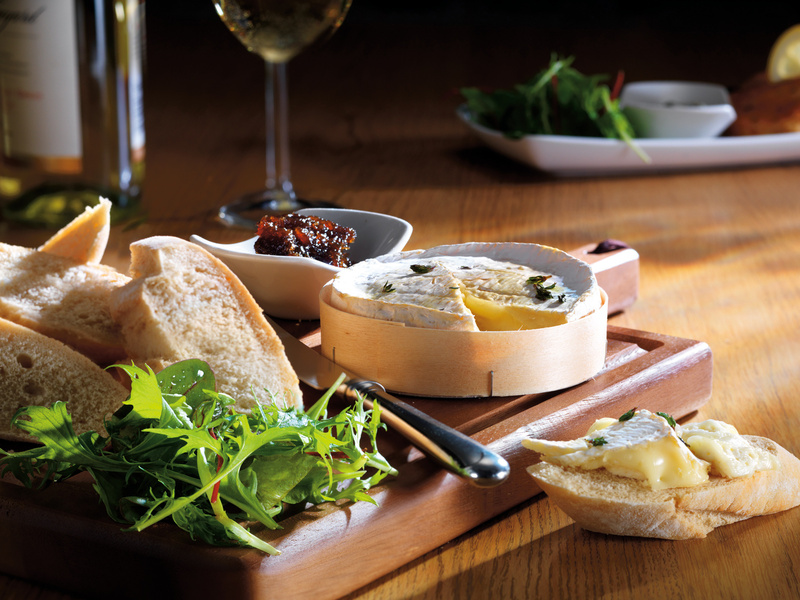 Give the dough a stir until your chips are pretty distributed. Now clump in your softened cream cheese. And with butter knife or similar utensil, slowly mix the cream cheese into the cookie dough using a circular pattern. 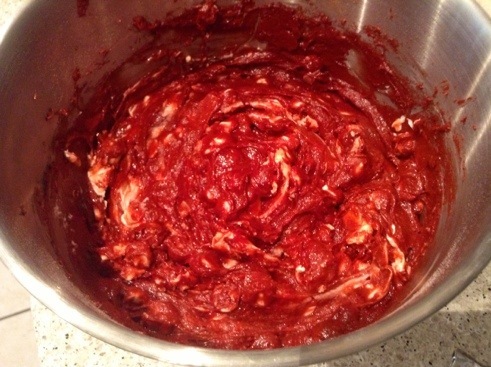 Be careful not to over mix to keep the “swirl” patterns. Onto a non-stick baking sheet, drop the cookie approximately two inches apart. 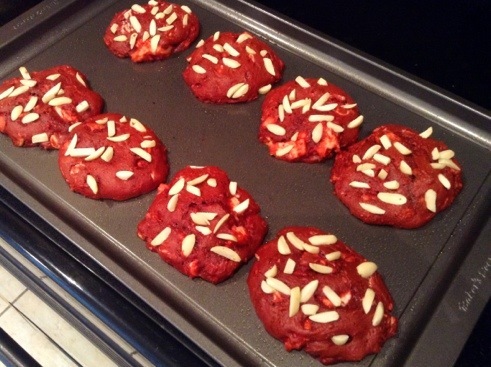 Sprinkle in the sliced or slivered almonds, sticking some directly into the cookie. And bake for 10-15 minutes to nice soft baked cookie texture. Bake longer for a crispier cookie. 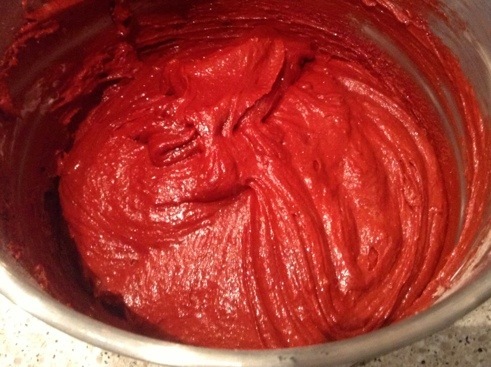 Once the red velvet cookies are finished baking, allow to cool for a couple of minutes before moving them to a baking rack to continue to cool. This recipe makes 2 dozen cookies. Enjoy with a big glass of milk! 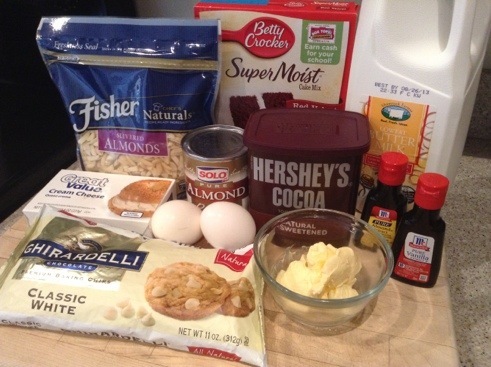 Smart cookie… Love the almond extract. Gives it a kick!